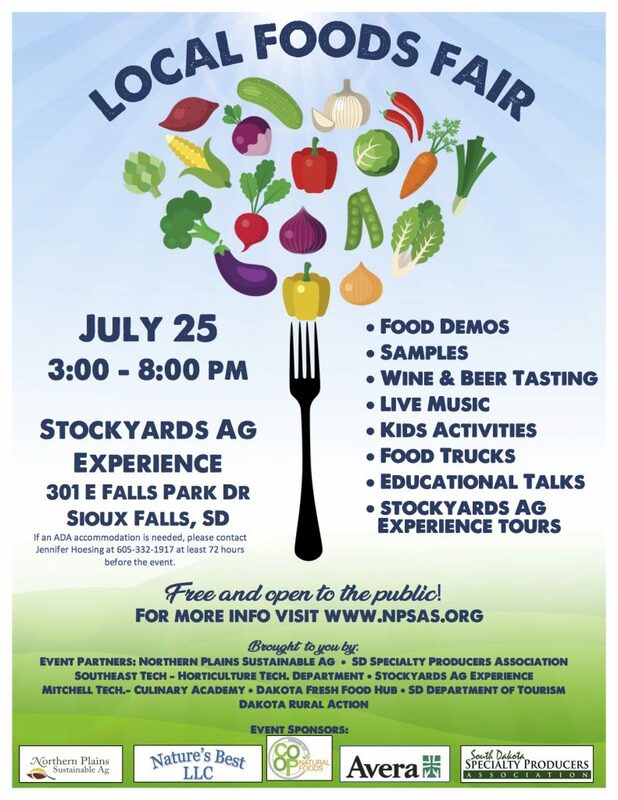 A Local Foods Fair will be held at Stockyards Ag Experience, 301 E Falls Park Dr, Sioux Falls, SD on Wednesday, July 25, 2018 starting at 3:00pm. The Local Foods Fair is a family friendly event that will focus on consumer education and awareness about local foods in the area. The event will showcase local foods through food demonstrations, vendor booths, and food trucks serving dishes using local products. A variety of local products will be available for sale. Consumers will also have the opportunity to learn about local foods and where to get them through educational talks and interactive demonstrations. There will also be kids’ activities and free admission to the Stockyards Ag Experience. Event Partners include: Northern Plains Sustainable Ag, SD Specialty Producers Association, Southeast Tech – Horticulture Department, Stockyards Ag Experience, Mitchell Tech – Culinary Academy, Dakota Fresh Food Hub, SD Department of Tourism and Dakota Rural Action.